Are you a tourist coming to Long Island for the first time? Or have you been to the city before but you love it and would want to explore it again? Well, you can be sure that the city has a lot to offer you in terms of attraction and rich culture. And when it comes to your transportation arrangement to all the fun places within the city, you can trust us to arrange the perfect limo service in Long Island that will take care of all your movement. Long Island is a densely populated and expansive island in Southeastern New York State. Along with its Atlantic coasts are stunning destinations like Montauk Point State Park, Jones Beach State Park, and Fire Island. On its east end is the North Fork which is home to many wineries you can explore. There are also the Hamptons towns known for their exquisite upscale homes, antique shops, and trendy restaurants. If you are visiting the Long Island, there are great and exciting things to do. 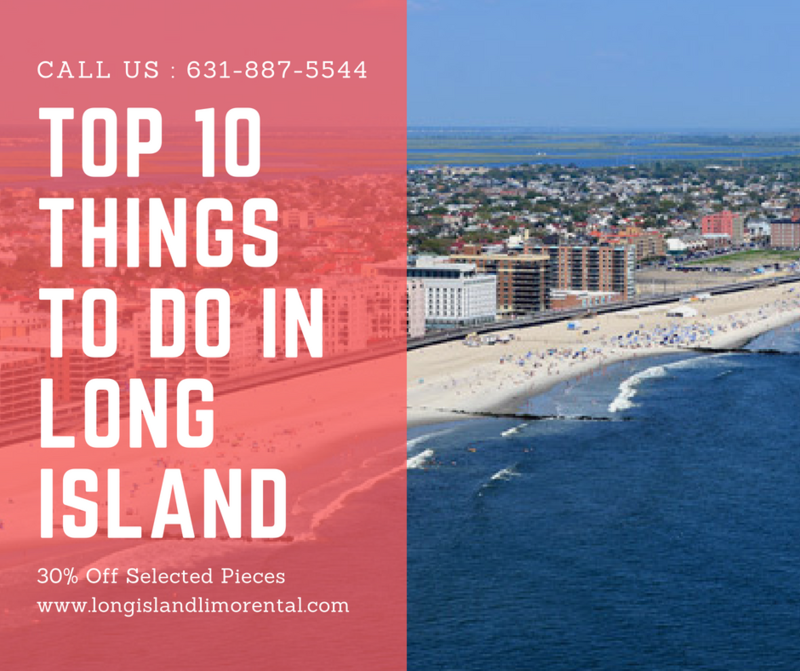 Here, we take you through the top ten things you can do in Long Island during your visit to the city. Remember, you don’t have to worry about your transportation arrangement. We can arrange the perfect Long Island Limo Service that will make your trip to all these attractions fun and seamless. Coney Island is a stunning peninsular suburban neighborhood, sparkling beaches, and entertainment/leisure destination in Long Island. Situated on Coney Island Channel, a part of the Lower Bay in the South-western area of the borough of Brooklyn, NY, this fun destination is definitely worth visiting during your visit to Long Island. There are amazing fun activities to explore and lots of entertainment awaiting you. And to make your trip luxurious and stylish, we will be delighted to arrange the perfect Limo to Coney Island, Long Island New York for you. You don’t have to worry about anything. Our chauffeur will be at your location to pick you up and take you to this attraction destination. You will absolutely love every moment of your experience. The Prospect Park is a City green space with modern basketball courts. If you love sports activities, then a trip to Prospect Park will be an exciting thing to do. This park features basketball and handball courts, a playground, and a historic home. There is so much fun at this Park and we assure you that you will love every minute you spend at this destination. We have got your transportation arrangement covered. We have the exquisite Limo to Prospect Park, Long Island New York that will be perfect for your trip to this destination. Enjoy a luxurious ride in a chauffeur-driven limo as you explore the beautiful Park of Long Island. Fun and excitements await you at this destination and we assure you a memorable experience when you use our service. Wherever you are, our chauffeur will pick you up and take you to the destination and when you have had your fill of the fun and entertainment, you will be chauffeur driven back to your location in luxury. This is another excellent attraction around Long Island. Visit this beautiful and mind-blowing attraction destination in grand style as we arrange our exceptional Limo to Brooklyn Bridge Park, Long Island New York for you. Featuring amazing hibachi-style BBQ grills, shaded picnic tables, and river views, you can bet you will have all the fun your heart desires. Arrive at this attractive destination and feel the gentle breeze on your face as you explore the beautiful views of the island. You can enjoy a beautiful and serene picnic at the Park or enjoy mouth-watering grills as you watch the splendor that the Park has to offer. You never need to worry about getting your way around the attraction destination. Our chauffeurs are professionals and are very conversant with the environment. So you can be sure that they will get you there in style and luxury. Our Limo Service in Long Island is one of the best in the city, so you can always trust us to arrange the perfect ride for you. If you want to get closer to nature, the Brooklyn Botanic Garden is the place to be. The destination features a kid-friendly annual Cherry Blossom Festival, a beautiful Japanese garden and so much more. Located on an expanse of land, the Brooklyn Botanic Garden is a stunning garden that you will love to explore. Are you planning a vacation with your kids? This garden is the perfect place to let them explore and we assure you that your kids will love every moment of their experience at the garden. You don’t need to worry about waiting for cabs to get to this destination. All you have to do is engage our service and our chauffeur will be at your hotel to pick you up and take you to the garden in luxury. Enjoy the beautiful scenes of the city as you cruise in a chauffeur driven Limo to Brooklyn Botanic Garden, Long Island New York. You definitely are set for a memorable and fun-filled journey. This is a beautiful and historic location around Long Island. The park features an enormous green space housing World’s Fair monuments, sports facilities, museums, a zoo, and so much more. If you are a lover of history, you definitely will enjoy your time at this attraction destination. The site offers amazing things to do that will make your visit exhilarating. Explore the historic beauty of this destination and also check the numerous animals at the zoo. You can bet that you will treasure every moment you spend at this Park. To make your movement seamless, engage our service to provide you with a luxurious transportation service. We offer top class Limo to Flushing Meadows-Corona Park, Long Island New York that will meet your taste and class. Our limos are fully loaded with amazing features that will make your trip enjoyable. Trust us with all your transportation arrangement in Long Island and we assure you of a seamless movement all through your stay in the city. Enjoy a beautiful Russian dining and a relaxed beach vibe at the Brighton Beach. The Brighton Beach is also known as ‘Little Odessa’ because of its tight-knit Eastern European and Russian communities. This attraction destination is a lively neighborhood with numerous high rise residential buildings and rich culture. Enjoy the beautiful and stunning beach as you lounge in a shaded area around the beach. And if you would love to take a dive in the cool beach, you can go ahead and enjoy. There is so much fun you can enjoy at this destination, that getting there early is the best way to soak in all the fun and excitement. You don’t have to worry about your transportation arrangement. Our chauffeur will be at your hotel as early as you want to pick you up so that you can have an early start at the fun places in the city. We will make an exceptional Limo to Brighton Beach, Long Island NY available to you in grand style and you will love every minute of your experience on our ride. Brooklyn Museum is a must-visit destination while you are in Long Island. This is a beautiful destination that houses amazing historical relics of the city. The Museum features Beaux-Arts landmarks known for ancient and modern art collections. It is also known as the Premier arts attraction on Prospect Park. If you want to explore world-class contemporary exhibitions, the Brooklyn Museum is the perfect destination to be. We make your trip to this destination smooth and stylish with our bespoke Limo Service to Brooklyn Museum, Long Island NY. Nothing compares to the experience you will have when you use our service. We assure you of the exciting and luxurious ride all through your time in our limo. It is absolutely going to be mind-blowing. If you are a huge fan of sports, then we will be delighted to give you a limo ride to this amazing attraction destination. The Barclays Center features a huge sports arena and concert venue that is unbelievable. This destination is home to the Brooklyn Nets basketball games, so if you are in town during the match season, you definitely should visit this destination. It is also an amazing location for boxing matches and concerts. There are events and sports regularly taking place at the venue, so if you are into sports, we assure you that you will love this destination. Our Limo Service to Barclays Center, Long Island New York will be available to take you to the place. Arrive at a concert at this destination in grand style with our world-class limo service. It is definitely an experience you will love. If you want to have an exhilarating ride on the beautiful waters around Long Island, then the Staten Island Ferry is the perfect choice for you. Enjoy the exciting and adrenalin gushing feeling of the Ferry as you take a ferry ride that runs 5.2 miles through New York Harbor. The Staten Island Ferry is a passenger ferry route that is being operated by the New York City Department of Transportation. The ferry is part of the attraction of the city and it is designed to give you an experience across the single route that runs through the 5.2 miles of New York Harbor. Getting to this destination can be achieved in style with our exceptional limo service. Our Limo to Staten Island Ferry, Long Island NY is the perfect choice of transportation for you. You don’t have to stress about anything. Our chauffeur will pick you up and take you to the destination and will also be waiting for you to take you back to your destination in comfort and style. For the lovers of beer, taking a tour through the Brooklyn Brewery is a grand idea worth exploring. If you want to enjoy a tour of the brewery and have a taste of the product, we would love to take you to this destination. The Brooklyn Brewery features Microbrewery with tastings and tours that give you an insider experience of the process of creation at the brewery. It is an experience that you will not forget in a very long while. You can arrive at this destination in style and class with our exclusive limo service. We offer state of the art Limo to Brooklyn Brewery that is comparable to none other. We assure you of an experience of a lifetime when you ride with us. Wherever you are, our chauffeur will be there to pick you up and take you to the destination. Our limos are fully loaded with top-notch features that will make your journey fun and enjoyable. And if you would love to go with a group of tourists, we can also arrange our Party Bus Rental for your transportation needs. Our party buses are luxurious and come with great leg room and amazing features that will make your journey comfortable, fun and exciting. We will be excited to make all your transportation arrangement all through your stay in Long Island. Wherever you plan to go, we will be at your service to provide you with an exception Limo Service in Long Island. When you are ready to explore all the beauty and excitement that Long Island and its environment has to offer, we will be there to provide you with a world-class Long Island Limo Service.